More inspiration from tutorials. In a lecture on organic aromaticity, the 4n+2/4n Hückel rule was introduced (in fact, neither rule appears to have actually been coined in this form by Hückel himself!). The simplest examples are respectively the cyclopropenyl cation and anion. The former has 2 π-electrons exhibiting cyclic delocalisation, and the 4n+2 (n=0) rule predicts aromaticity. Accordingly, all three C-C distances are the same (1.363Å). So, time for a calculation. Well, it turns out there are two isomers of the anion. 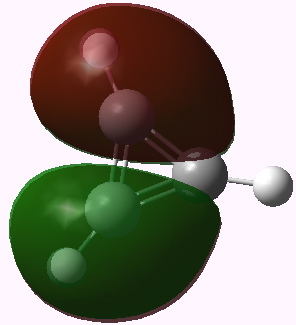 The first has two C-C bond lengths of 1.383Å and one of 1.841Å; two short and one (very) long. Moreover, the whole system is very much non planar. This isomer turns out to be really a 4π-allyl anion in disguise. To avoid any danger of cyclic conjugation (and hence antiaromaticity), the groups at the end of the allyl fragment rotate. 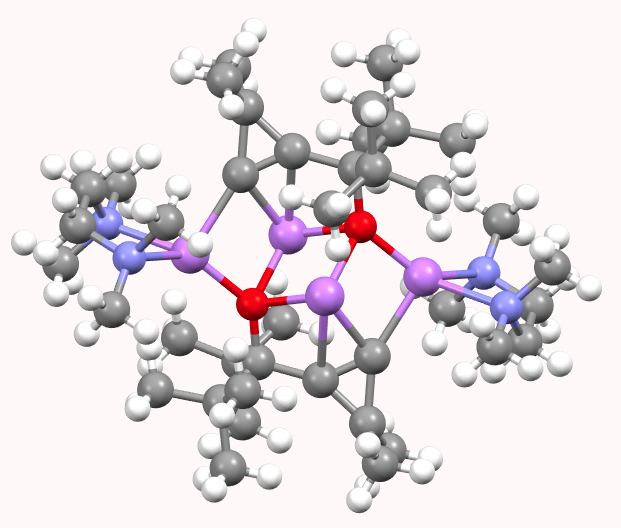 So yes, this IS a 4π-electron system, but the molecule has cleverly distorted to avoid antiaromaticity as best it can. What about the second isomer? This now has one short (1.293Å) and two long (1.598Å) C-C lengths. The carbon bearing the two long bonds is now highly non planar. 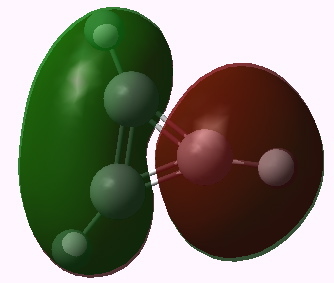 It is best described as an isolated double bond (2 π-electrons) trying to get as far away as possible, and to avoid as much overlap as it can, with a lone pair (NOT π) on the third carbon. Now, the lone pair really does NOT count, since it is too far from the other 2 π-electrons, and inclined at the wrong angle, to overlap effectively with them. The two isomers are almost the same in energy (the first being the lower in free energy by ~1 kcal/mol). So what kind of answer would one give to the inquisitive tutee? Firstly, as the name implies, antiaromaticity is not good for a molecule. If it possibly can, it will avoid it. For the cyclopropenium anion, there are two quite effective ways of avoiding antiaromaticity. It is not, as a result, actually a good example of an antiaromatic system. Because molecules can be very clever at avoiding antiaromaticity, remarkably few examples of genuine antiaromatics actually exist! I end with another way of looking at this problem using group theory. The cyclopropenium cation has D3h symmetry, and the LUMO (lowest unoccupied) molecule orbital in fact belongs to the E” irreducible representation. This means it is doubly degenerate. 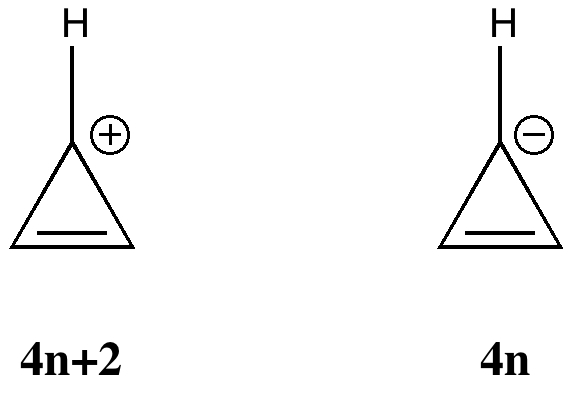 To form the anion from it, two electrons must be placed in one of these orbitals (but unless an open shell is formed, one cannot place one electron in each). Whichever orbital receives the two electrons is now stabilised, the degeneracy must break, and the resulting geometry must reflect this. The two symmetry-broken geometries are precisely those shown above. This entry was posted on Tuesday, December 7th, 2010 at 6:16 pm and is filed under Interesting chemistry. You can follow any responses to this entry through the RSS 2.0 feed. You can leave a response, or trackback from your own site. There is a third way that cyclopropenyl anion can get out of antiaromaticity. Instead of one hydrogen atom attached to each carbon, there might be two hydrogen atoms on one and none on another. This pattern (1-cyclopropenyl instead of 3-cyclopropenly anion) is seen in azirenes, which are isoelectronic with cyclopropenyl anions but are uncharged due to there being a nitrogen atom in place of one ring carbon. The nitrogen ends up with no ligand. Also look up cyclopropenyl lithium compounds where the Li atom is on a vinylic carbon instead of the saturated carbon where we’d expect it. Thanks Oscar. Another way of expressing your observation is that anti-aromaticity can result in a considerable change in the pKa of a proton. It would be interesting to quantify this effect. Oscar mentions cyclopropenyl lithium compounds. A typical example (doi: 10.1021/ja9603362) is shown below. 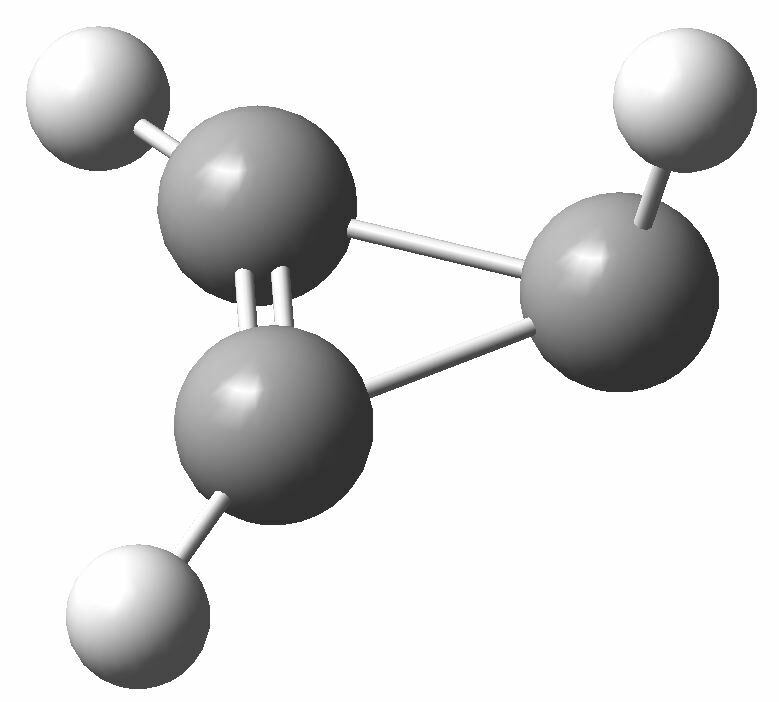 Here, the ligand is Me, and instead of being on the vinylic carbon, it is [1,2] migrated to form a vinyl carbanion (to which the Li is attached). You mentioned in your last paragraph that the pair of electrons for the dianion would occupy only one of the two degenerate orbitals. What is the impetus for avoiding an open shell arrangement? Isn’t an open shell preferred in degenerate cases according to Hund’s Rule of Maximum Multiplicity? The impetus depends on how much geometric distortion the closed shell occupancy of a single orbital can achieve. 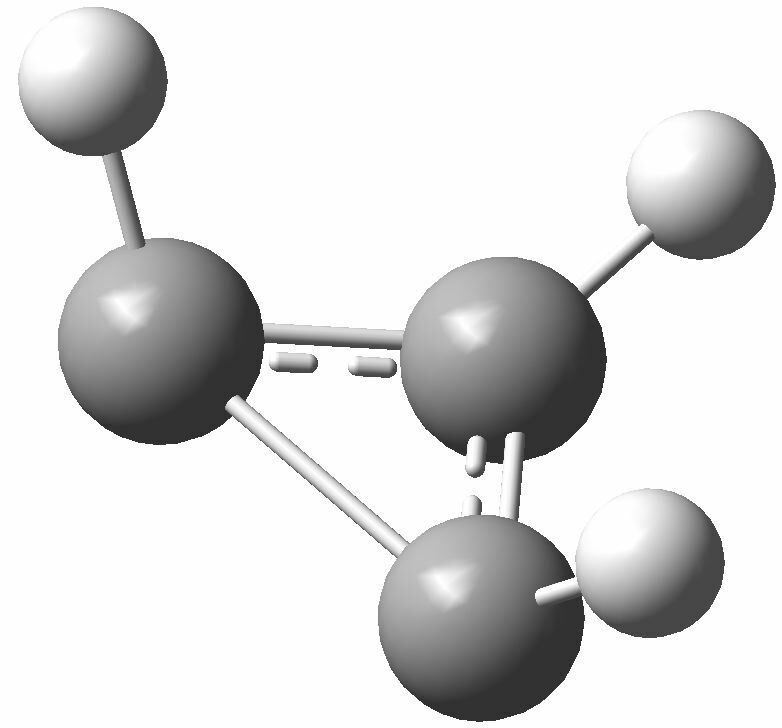 Cyclobutadiene does not achieve much, and so indeed its ground state is a triplet open shell. The non-planar cyclopropenyl anion may be capable of greater distortion, thus preserving a singlet state. Of course, it may also depend on the counter-ion, solvent, and other factors. The triplet state of the cyclopropenium anion is 1.7 kcal/mol higher in energy than the lower of the two distorted singlets described above. In fact this form of the triplet is also distorted, with all three H atoms in a different plane from the three carbon atoms. The all-planar, "aromatic" triplet anion (with three equal C-C bonds, 1.439A) is in fact 28.6 kcal/mol higher than the distorted singlet species above. You means C3v structure like a frustrum? (anti)aromaticity avoided: a tutorial example is licensed by Henry Rzepa under a Creative Commons Attribution-Noncommercial-Share Alike 3.0 United States License.